The joint CWA District 1 and District 2-13 Bargaining Committee would like to announce that a Tentative Agreement with Dex Media, Inc. has been reached. The Agreement covers the Bargaining Units of Maryland/Virginia, New England, New Jersey, New York, Pennsylvania and Connecticut Sales Offices. The new two-year agreement contains base wage improvements for BA’s with greater than one (1) year service and/or protections for all BA’s while implementing a new Pay Area concept impacting the Compensation Plan. BA’s with greater than five (5) years will be raised to Mid-Point or a minimum of 2%, whichever is greater unless already at maximum. BA’s within one (1) to four (4) years’ service will receive a $500 base pay increase. Lump sum payments were agreed for those with less than one (1) year service. The Committee was successful in pushing back Dex in several key areas. Dex wanted to eliminate the Flat Rate Car Reimbursement option. It is retained. Dex sought to slash the million-dollar penalty when new compensation plans produce a diminishment of 5% or more in earnings. It is retained. Dex sought to implement six (6) pay areas, starting with ZERO. The Union insisted that a ZERO Pay Area was unacceptable; Dex withdrew and eliminated Pay Area Zero. This is the first agreement that raises the base wage of BA’s, some significantly, in several years. Your Local will be providing additional information on the agreement and ratification process. When we fight, we win!! Bargaining, or lack thereof, continued today with DexYP. Since the company refused to modify any of their retrogressive demands or address any of the issues you identified in your bargaining surveys, we were unable to come to an agreement. The Union asked for a contract extension and the company refused. Therefore we are currently working without a contract!!! There should be no changes in any of the terms and conditions of your employment ranging from benefits, comp plans, hourly rates etc. If anyone is placed on any discipline they should call their local IMMEDIATELY!! The grievance process will remain but discipline will be argued at the bargaining table going forward. Dex continues to persist in their demands. We are aware that some of you have received bargaining and ratification reports from California - IBEW: Please know that these are not the same proposals that Dex has demanded at the District 1 and District 2-13 tables. Removal of your flat rate car plans and cutting of compensation rates in some areas still remain on the table. No one should be forced to sell a product for 20% less in commission just because of the market that they are in. We remain available to discuss these disgusting proposals and their shortcomings with the company. We will advise when the next bargaining session is scheduled and keep you updated when it occurs. Please reach out to your locals for upcoming mobilization activities. Our contracts expire tomorrow, Friday, October 12th at midnight. Bargaining is scheduled to resume tomorrow. After spending the majority of this week in a series of committee meetings in order to respond to the Company’s retrogressive demands on your compensation plan, flat rate car reimbursement and other terms and conditions, we passed a comprehensive proposal today that adequately addresses your concerns with improvements in Pay Areas, General Wage increases, Business Tools, Health Care and other Conditions of Employment. We are seeing Dex’s greed in Districts 3 and 6, and Dex management thinks that they will force their insidious demands upon us here in District 1 also. We are looking into actions united with Districts 1, 2-13, 3 and 6 in order to assure a fair contract for all! We will keep you updated as bargaining continues!!! Bargaining continued today and the Company persisted with their retrogressive demands and proposals. We are continuing to discuss our concerns about the new Motus application and their intent to eliminate the flat car payment reimbursement. Today, we received a presentation on your health and welfare benefits and while they did not have the premium cost share numbers, they did advise that the costs are going to increase. How much more could we pay before they can't call it an "employer sponsored plan" anymore? They think we won't fight back and we will take anything they are willing to give to us! It’s time for us to fight back and let management know that they cannot walk over us anymore. We are the money makers for this company and we need a bigger piece of the profits. Please reach out to your local if you are willing to assist in mobilization activities!!! The joint CWA District 1 and 2-13 Bargaining Team opened negotiations for a new contract today. The current agreement expires Friday October 12, 2018. After hearing (again) that Dex continues to be a company in decline in terms of clients and revenue, Dex went on to claim a need for greater flexibility, simplifying processes and the ever popular, reduce costs. Revisions of the current Comp Plan. Adjust down the $1 million remedy when a new Comp plan reduces the Total Targeted Comp of the prior plan by 5% or more. Remove the Flat Transportation Allowance. Dex also wants to move people off the payroll who “do not execute new business and Thryv sales in support of the Company’s growth strategy”. Dex also presented yet another new Comp Plan concept. We are reviewing Dex’s proposals and will start to present your proposals tomorrow. We have also insisted that the Company’s Modus program of Sales Rep and mileage tracking be negotiated. Updates will be provided as bargaining progresses. 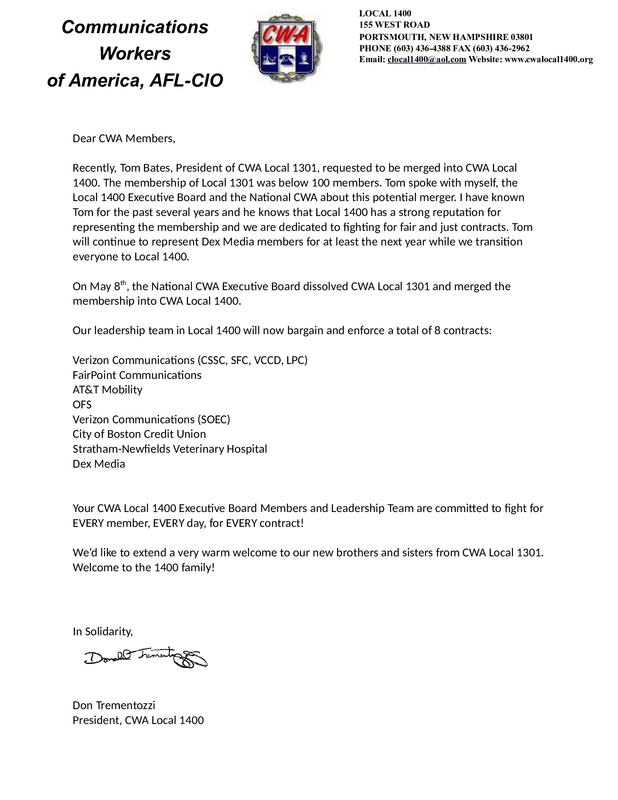 CWA Local 1400 and Dex Yp have come to an Agreement to extend the current Collective Bargaining Agreement (CBA) for ONE (1) additional year. The current CBA was set to expire on October 13, 2017. The NEW expiration of the CBA will be October 12, 2018. All parts of the Collective Bargaining Agreement (CBA) will be in force as part of the Memorandum of Agreement. After several weeks of discussion between the Dex Yp Labor Relations and the CWA Bargaining Team, we came to the Agreement to extend until October 12, 2018. The extension covers CWA District One (New York/New England) and CWA District 2/13 (Mid Atlantic). Dex Yp purchased YP.com Holdings on June 30, 2017. YP.com Holdings has several Bargaining Units that are currently covered by the Communications Workers of America (CWA) and the International Brotherhood of Electrical Workers (IBEW). For the most part, the collective bargaining agreements covering several thousand members at YP Holdings (now Dex Yp) expire in 2018. We continue to discuss the day to day issues with Dex Yp and have several active grievances and arbitrations ongoing. We will continue to engage Dex Yp on the issues that arise knowing we have the protections of the Collective Bargaining Agreement in place.